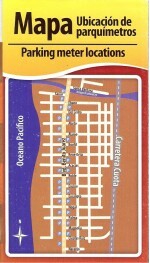 HomeRosarito Metered Parking “Pay And Display” By: Miguel Sedano. Pay and Display means you buy a ticket from the machines located in main street and to avoid a fine you must display your ticket on the dashboard. How do I use a SmartMeter? To use a SmartMeter, just walk to the nearest pay station and make a payment. SmartMeters are usually in the middle of every block on both sides, so you shouldn’t have to walk far. The instructions are clearly marked on the machine. To print your receipt, press the green button. The pay station will print out a receipt showing the amount paid, the date, and the expiration time. To avoid a fine you must display your ticket on the dashboard. In the Downtown District, parking meters operate 8 a.m. to 10 p.m., Monday through Sunday, unless otherwise posted. What if I don’t use up my time? While your receipt is still valid, you can move your car to another SmartMeter space. There are no refunds for unused time. SmartMeters Accepts Mexican Pesos Coins and 25 Cents US Coins, The Parking meters DON’T GIVE CHANGE. 25 Cents are good for 15 minutes.